Hello everyone! It’s been quiet here for a bit, not because my drafts folder isn’t full of future posts but because I’ve been on research leave working on a book (yes! it’s the book of the blog!) and I didn’t want to write anything about writing because… well, longterm readers will remember the disaster of the Writing the Article series (the link takes you to the start, but here is the sorry end). That was a great example of failing in public, for which there is absolutely a place. But I’m really excited about this book, and I’m not the only author so I don’t want to let my co-authors down. BUT: I’ve been on research leave for about a month now, and I’ll be on part time writing leave until Easter, and so I wanted to talk about one planning technique that is absolutely working for me. I’m a bit more in the flow of things now, so the March plan is much more barebones, but still, I still try to plan three things for every writing day. Plan exactly how long I will write for, and what I will write (or edit!). A meet up with a friend. This means I’ll actually get something done every time I sit down to write. Usually I plan to write for 2 hours and produce about 1000 words; but this week I’m focusing on editing instead because I’m half way through one project and nearly finished the other. It helps give my day structure. It gives me regular rewards. It keeps me mentally and physically healthy. Too often research days disappear into a smear of procrastination and tiny tasks, or they go well and you disappear into the text only to emerge three days later with a bad back and having forgotten how to do human contact. Neither is good for you. Job applications, examining and peer reviewing also count as writing or editing time, so I’m factoring in all the things I’ve promised to submit and read this month too–I have a PhD thesis to read, a short story competition to judge, and some posters to review for a conference this week on top of editing my own work. Excercise can be going to the gym or a yoga class (and generally I’m finding a class is a very good way to make sure I don’t forget! ), but it can also be a walk or some gardening. This plan is simple enough to work, flexible enough to work for your life, and sustainable. I hope it helps you when you next have a day, a week or a few months to do some research! I’m taking some annual leave in order to focus on 6000 word article for registration viva for EdD. Need a plan of action and this sounds good. Maybe will cut out procrastination and backache. Thanks for writing. Like the look if the desk and coffee. 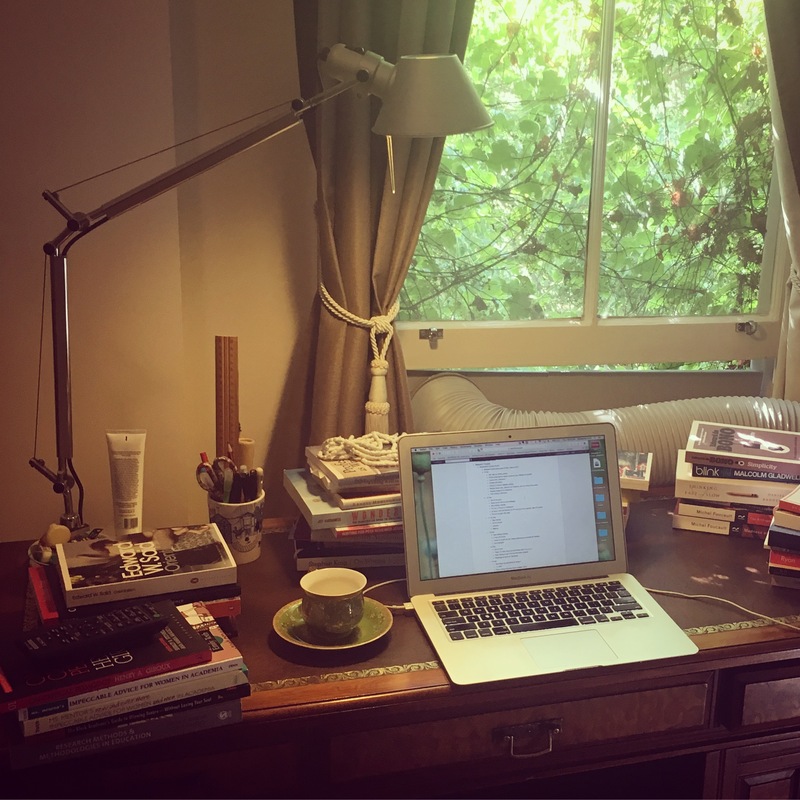 Hope the writing goes well–and yes, a good desk, good coffee and a room of one’s own also help! Tell me how it goes! Thanks; this is very helpful. I’ve read your brief note about ‘to do’ lists. Can you tell us more about how you use WorkFlowy? Is there an app for it, or is it only web-based? Hi Steve, there is definitely an app (which synchs with the desktop!) I’ve been meaning to write a post about it–so I’ll get onto that next week!